Lovely, private, ground-floor condominium (no steps) with two lanais overlooking the ocean and the beautiful Hawaiian Scared Land of Prince Kuhio park. a medical emergency has made the dates of Jan 14 to Jan 25 available . Rental for these dates are for the entire time. Tastefully furnished with lovely new furniture, new granite kitchen and bathroom, 2 flat screen TV's and fully equipped with everything you need for a wonderful vacation. Beautiful tropical gardens surrounding private pool and barbecue. This condo with comfortable king bed only sleeps two. Medical issue has caused a month cancellation for March. It won't last long so take advantage and book now. Kauai's best snorkeling about 100 feet from the condominium. Enjoy the gorgeous Kauai sunsets from the famous Beach House Restaurant just up the street. love to golf with friends, travel, enjoy grandchildren and our new dog, Cooper. Kauai is a very special place to get away from the Western Washington winter rain! 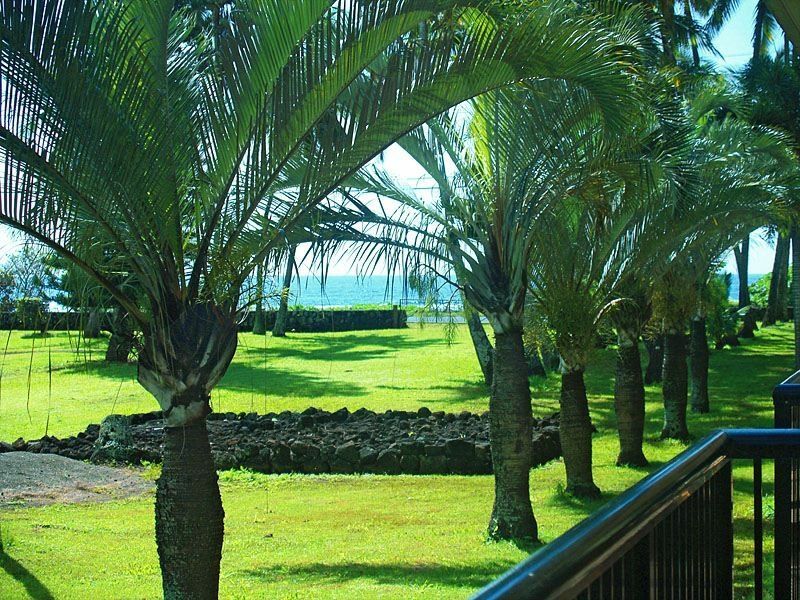 Lanai overlooks the lovely Hawaiian Sacred Prince Kuhio Park with ocean beyond. Of all the places we have stayed on Kauai, we loved this the best. The view in the photos shows palm trees and some ocean but the view is even better because some of those trees have been removed. The unit was really everything we wanted - full kitchen facilities with all the pots, pans, utensils, blender which we used to make smoothies every morning and even shish kebab skewers we used for shrimp and pineapple kebabs. The grills in the garden area were very nice large and good quality. The space was clean and recently upgraded with granite countertops and new art and furnishings. The manager was very responsive and helpful with any question or request. Unit 115 is nice because it has 2 ocean side lanais while the other units mostly have only one ocean side and one toward the garden and parking area. The unit was well cooled with the windows and the fans and the door slats. The location was beautiful will a beautiful beach just across the street and others very near by and all the attractions of Poipu are just a few blocks away yet this is a very quiet and lower traffic area. We enjoyed visiting spouting horn , Lawai beach, Poipu beach, doing the Mahaulepu trail and visiting the cave. We would recommend this to anyone who would like to visit beautiful Kauai and get a lovely place for a small price. We were happy with our choice of PK115. It is a spacious condo with a great floor plan. The living area and the bedroom each have a lanai looking onto the park and the ocean beyond. The kitchen is well equipped and everything was clean. The instructions and descriptions given to us were helpful and we loved the location. The road past the condo is a dead-end so it is quieter (apart from the roosters!) than the busier hotel area of Poipu. We would recommend this condo to anyone. Prince Kuhio is a very nice complex with a lovely pool and a community grilling area. Unit #303 is very nice and clean and had everything we needed. It has a lovely enclosed lanai with a beautiful ocean view...a perfect room to drink your coffee in the morning and listen to and watch the waves. You even have a view of the ocean from the shower! The bed is very comfortable. The owners are very easy to work with and have provided everything you need for a stress free vacation. Additionally, the unit is just a few steps from some of the best snorkeling around as well as awesome sunsets. The complex is across the street from The Beach House restaurant and a 10 minute walk to The Shops at Kukui'ula where there are several restaurants and shops. We were there for 8 days and didn't want to leave. We will definitely stay again in the future. It was the perfect vacation. The condo had everything we could want from a complete kitchen to a comfortable king size bed. Having stayed in many condos during our vacations, we found this one to be the best stocked and most comfortable. We loved being on the ground floor with no stairs to climb. The unit was very quiet, had a comfortable lanai where we had coffee in the morning sun and lunch in the shade. We enjoyed all the helpful information that was sent to us prior to arrival. The renal car information, restaurants, and "things to do" info was right on and saved us lots of planning time. Loved the Tidepools Restaurant for our Anniversary. Will be back for sure to stay longer. Thank you for making this the best Anniversary Yet. There is a $150 cancellation fee regardless of when you cancel. Full refund is provided less the $150 fee if cancelled 30 days prior to arrival for standard season. No refund is provided if less than 30 days. Cancellation rates are 60 days prior to arrival during Holiday and High season.